Over recent days I have been sharing photos and writing about our recent family visit to the Australian Reptile Park near Gosford north of Sydney. I’ve shown a few birds which were not in aviaries, and now I plan to show some of their captive birds. Today’s photo shows a Brolga, one of our larger birds, once known as an Native Companion and even an Australian Crane. They are widespread in northern and eastern Australia, but are uncommon in southern parts of our country. 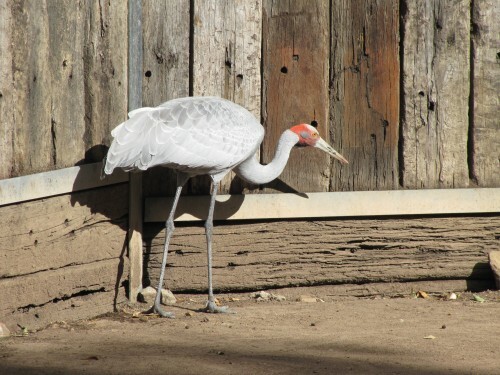 The bird in the photo was a captive bird in an enclosure at the reptile park. I have seen others in zoos, but only once have I seen this species in the wild. Many years ago a saw a dozen or so in a swampy area in the extreme south-east of South Australia.